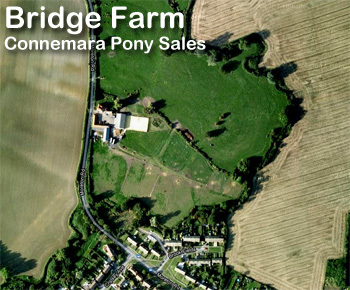 Ballydoolagh Comet by Monaghanstown Pat is a 4 year old Connemara gelding with excellent conformation and presence. 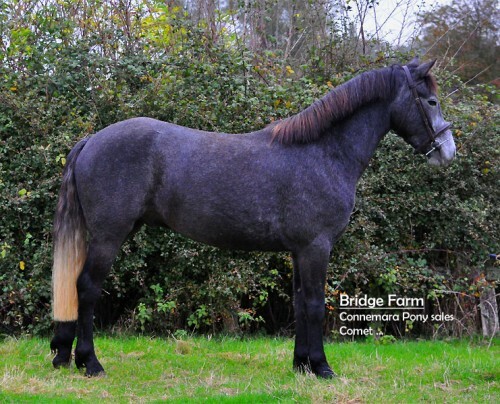 Also in his breeding: Moy Hazy Cove, Rebelwind, Hazy Dawn, Island Shawn and The Admiral. 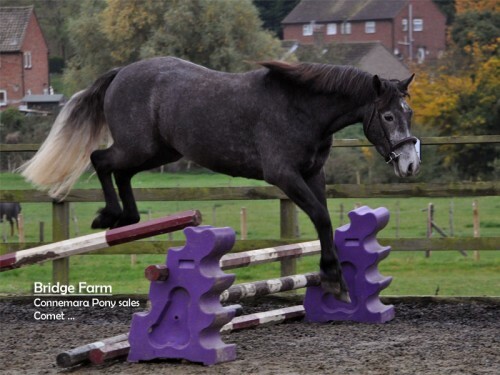 Comet has very good temperament and great movement, he is currently standing approximately 14.1hh. 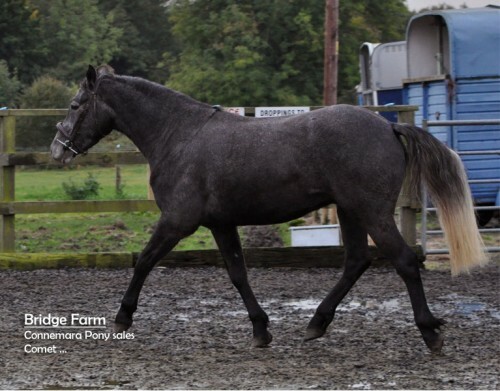 Comet is a lovely young Connemara gelding and our video doesn’t really do him justice (our first try), but we will add photo’s as soon as time allows. 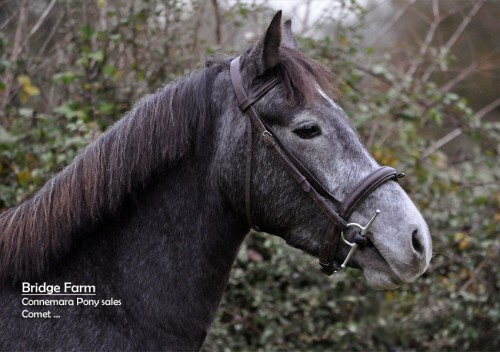 He has a lovely small head and is a very well put together Connemara who will definitely attract attention in the show ring. Comet loads and travels well and has been well handled. We have loose jumped him and he was fabulous. He really has an exceptional jump if that’s what you’re looking for in a Connemara gelding. We believe he’ll reach County standard in the show ring. Ballydoolagh Comet is currently being broken and is walking, trotting and cantering nicely. He is going over trotting poles all very quietly and will be hacking very shortly . Competitively Priced at £SOLD. A snip for someone with an eye for real potential. Comet arrived Thursday, and has settled in very well and it’s like he’s been with us forever already, and everyone at the yard is making a fuss of him. I can honestly say that buying Comet has been a great experience Belinda has been fantastic phoning me all the time keeping me informed of Comet progress and letting me text her all the time with my many questions. I am so pleased with Comet he is the perfect horse for me and I am extremely happy with him and I can’t recommend Belinda enough. Nothing was too much trouble, she was very honest and helpful and Comet is everything Belinda said he was.